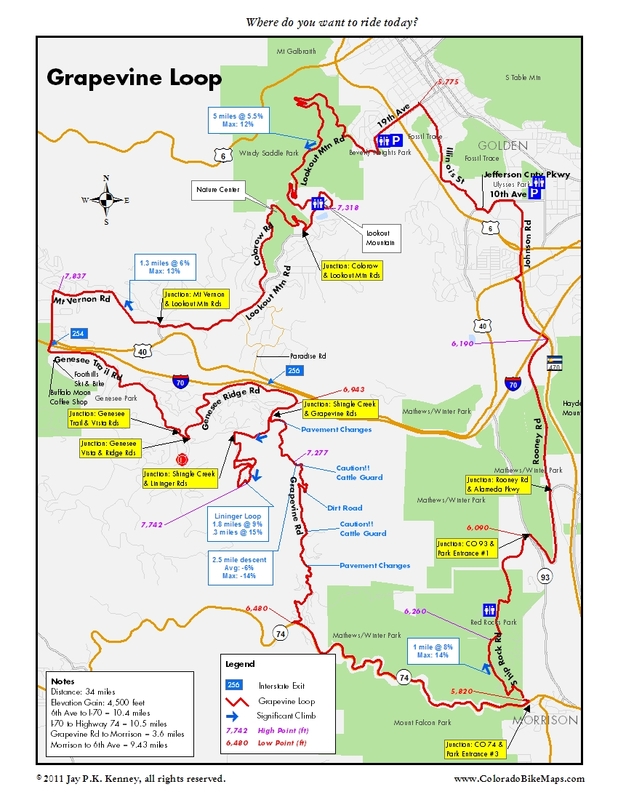 The next time you find yourself bored with whatever your standard route is around the Lookout Mountain area, check out the Grapevine Loop. It’s got great aesthetics, challenging hills, serious remoteness for being so close to I-70, and bomber descents. Many variations are possible. I’ve shown it here the way I discovered it, as a counterclockwise loop from Golden. I have a slight preference for counterclockwise because it means you are descending Highway 74 and the Genesee roads (Trail and Ridge)–and I like that better than having cars whizzing by me while I’m plugging along at 10 mph uphill. But you’ll see lots of cyclists coming up 74 from Morrison en route to Kittredge and Evergreen, so it is not all bad to go clockwise. If you are in a hurry, skip Mt Vernon Rd and drop directly down to I-70 from Lookout Mountain Road via Charros or Paradise roads. Both will put you near Exit 256 and the beginning of Grapevine Rd. Another challenging option is to ride down to 74 then turn around and ride back up. There are definitely some steep spots, and the dirt road can be tricky, but there’s rarely much traffic and you can use the whole road if you need to. Finally, you can also skip the Shingle Creek and Lininger Loop section, especially if short, super-steep hills intimidate you. Start this one in or near Golden. You can ride in from the east or drive out and find ample parking at Ulysses Park, Beverly Heights Park, or almost anywhere along Illinois St. On the weekends there’s also easy parking in and around the Jefferson County Justice Center Complex. Make your way up Lookout Mountain. For extra climbing points, take the optional detour up to the Nature Center before dropping back down to Lookout Mtn Rd. Ride along to Mt Vernon Rd, climbing steeply but briefly to the high point of the ride at 7,837 feet. The red barn is the conic marker here. Cross I-70 at Exit 254 and head down the frontage road, stopping if you’re inclined or in need at the espresso shop or bike store conveniently located here. It is around four miles to Grapevine Road, all of downhill save a short stretch linking Genesee Trail and Genesee Ridge roads. At the stop sign near exit 256 ride east. Grapevine Rd begins here. A swooping right turn brings you to Shingle Creek Rd. Go right for some extra climbing, go straight to stay with Grapevine. If you head up the Lininger Loop, know that clockwise is steeper than counter-clockwise. This is a pretty remote part of the development, so respect the residents’ privacy by neither clustering loudly at the top of the Loop nor leaving your trash behind. Return to Grapevine Rd and climb south. Shortly after the Shingle Creek junction, Grapevine’s pavement begins to deteriorate and eventually turns into a full on dirt road. After the high point you’ll encounter a cattle guard, some interesting dirt switchbacks, and yet another cattle guard. Whatever else you might do on a cattle guard, don’t stop and try to put your foot down. Just keep going. And keep going straight! Admire the views in all directions. Two-thirds of the way down, the road becomes paved again. Follow it to Highway 74. Ride down to Morrison, about 3.5 miles. Look for Red Rocks entrance #3 just outside Morrison. Turn left. Climb sharply up to the south parking area of the amphitheater along Ship Rock Road. Jog around the amphitheater to Trading Post Road, then exit the park at Highway 93, crossing over to Alameda Parkway to climb up and over the car-free Dinosaur Ridge. After where you’ve been, this short climb is a piece of cake. Find Rooney Road on the east side of Dinosaur Ridge and head north, crossing I-70 (under it) and US 40 (at the traffic light), and locate the bicycle trail that sits in the shadow of C-470 just after the junction of Rooney Rd and US 40. From the light look for the sidewalk on the north side of US 40. Cross 6th Avenue to reach Johnson Rd and make your way back to your parking place. With FasTracks construction in full bloom, the Golden Bike Trial between Johnson Rd and Jefferson County Parkway has been disrupted. Use the west sidewalk along Johnson Rd or ride directly on Johnson Rd.